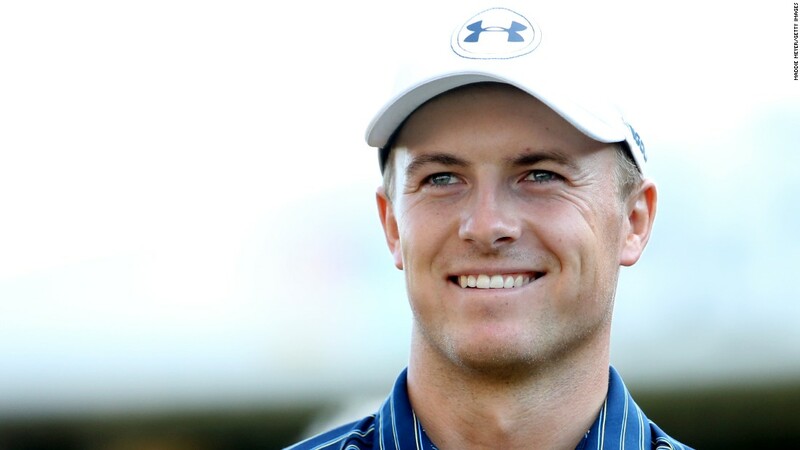 (CNN) His peers are calling him “golden child” as Jordan Spieth’s 10th PGA Tour win led to renewed comparisons with Tiger Woods. The Texan mirrored his first title in 2013 by holing out from a bunker, this time in a playoff to beat Daniel Berger in the Travelers Championship at TPC River Highlands. The toss of the club, the dash from the sand and the celebratory body-slam with caddie Michael Greller was a reminder Spieth is still only 23. The significance of his win is striking — the only other player to win at least 10 times before the age of 24 is Woods. The 14-time major champion went on to win 15 times before his 24th birthday. Spieth, who also holed out from a bunker to get into a playoff en route to winning his breakthrough title four years ago, tried to cool comparisons with other players. “I’m hesitant and will speak out adamantly about not comparing myself to anybody else,” said Spieth, who moved back to world No.3 with his second win of the year. Whether he likes it or not, comparisons are inevitable. In 2015, he became the youngest player to win two majors since Gene Sarazen in 1922 when he landed the Masters and US Open as a 21-year-old. He was the second youngest Masters champion behind Woods — who was 21 and nearly four months when he won in 1997 — and the youngest to win the US Open since Bobby Jones in 1923. It took Woods another two years to add a second major. In the next major of 2015, the British Open at St. Andrews, Spieth missed a playoff by one shot, and came second in the final major of 2015. That August, having just turned 22, he became the second youngest world No.1, after Woods. Speith was on target to win back-to-back Masters titles in 2016 until blowing a five-shot lead on the 10th tee in the final round, finishing second. The fallout appeared to knock Spieth’s ice-cool demeanor and seemingly impregnable confidence. A tied 11th at Augusta this year has been his best major finish, although he has since won three times on the PGA Tour. Woods, by contrast, won five majors by the age of 25, one better than all-time major record holder Jack Nicklaus and Northern Ireland’s Rory McIlroy, who has not won one of golf’s big four events since 2014. Spieth is not 25 until July 2018, which gives him five majors to chase the next landmark. Judging by his 10th win, the “golden child” in shining again.